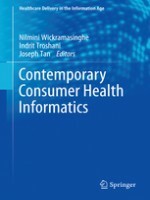 This innovative reference examines how consumer health informatics (CHI) can transform healthcare systems stressed by staffing shortages and budget constraints and challenged by patients taking a more active role in their care. It situates CHI as vital to upgrading healthcare service delivery, detailing the relationship between health information technologies and quality healthcare, and outlining what stakeholders need to learn for health IT systems to function effectively. Wide-ranging content identifies critical issues and answers key questions at the consumer, practitioner, administration, and staff levels, using examples from diverse conditions, countries, technologies, and specialties. In this framework, the benefits of CHI are seen across service domains, from individual patients and consumers to healthcare systems and global health entities.